Hanukkah, which begins December 24, reminds us of a difficult historical period that, against all odds, turned victorious: In 160 B.C.E., the Maccabee warriors recovered the Holy Temple in Jerusalem from the Greek Hellenists and rekindled the flames of sacred worship. Likewise, in more recent personal, communal and world events, there have been dark moments as well as bright and hopeful ones. From the movements for civil rights in the 1960s to the liberation of Jerusalem in 1967, the decades of intermittent Arab-Israeli peace processes to the fall of the Soviet Union in the early 1990s, many observers felt that goodness was taking hold in the world. But then on September 11, 2001, terrorism came to American shores, followed by the disintegration of the Middle East and the Islamic State’s barbaric assaults. Domestically, we continue to uncover layers of past violence—in traumatized veterans, victims of sexual abuse and persistent pockets of poverty. Racism and sexism are also still alive, despite generations of Maccabean-like warriors for justice who had spent the previous century trying to eradicate them. But even when catastrophes darken lives, the lights—of hope and spirituality—are kept alive “from generation to generation.” The Maccabean victory was a bright moment, yet it was part of a war that lasted more than a generation. Two centuries later, in 70 C.E., the Romans destroyed the Temple, but the rabbis ingeniously restructured Jewish life with houses of study outside Jerusalem and rebuilt the Jewish people, guiding them through exile from the Land of Israel. The flux of darkness and light continued through the Middle Ages, which was rife with war and violence but also saw the rise of the Renaissance (15th to 16th centuries) and later the Enlightenment (17th to 18th centuries), which together brought new cultural and scientific achievements. But even in those illuminated periods, there were pockets of darkness. Enlightenment philosophers thought that human ills would be cured with clear thinking, but their successors in the human sciences discovered there were ancient hatreds and deeply rooted fears that continued to provide “reasons” for war, oppression, secrecy and tyranny. Just as in the greater society, so, too, do we suffer frustration, anger, despair or pain in our personal lives. But as those who have survived traumas know, we must never give in to negativity or forget the accomplishments of the past. Our tradition teaches us that despite the darkness, light must be cultivated. 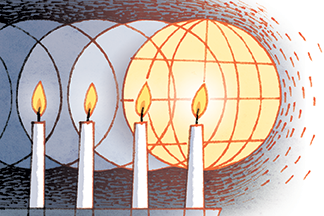 Hanukkah, especially, is an opportunity to renew our dedication to illuminating our own corners of the world, wherever we have influence. “Light” means honoring those who carried the torch before us. “Light” means sharing the insights from our own lives. “Light” means helping our children and grandchildren bring out the light that is in them. Our deep personal work and our efforts for the larger world call for courage and perseverance. “Hazak ve’-ametz!” Moses told Joshua. “Be strong and courageous!” Lighting the Hanukkah candles is an act of courage and faith, proclaiming to ourselves and others that the light continues to penetrate the darkness. These lights we kindle for the miracles and wonders, deliverances and battles that You performed for our ancestors in those days at this season. Tamar Frankiel is professor of comparative religion at the Academy for Jewish Religion in Los Angeles. Her latest book, Loving Prayer, is being published this month by Gaon Books.